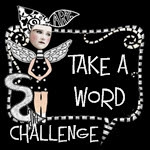 For this week's Journal52 challenge, the goal was to create found poetry. So this Found Poetry Fairy is the result of a book page that I received from another group member. in a moment that took up far too much of the space, love, she noticed, is the distant ocean of silence. I used acrylic paints for this and some stenciling. I also spritzed it at the end with some glimmer mist so that it has a sort of shimmer to it, though you can't really see that in the photo. This was challenging, but fun. 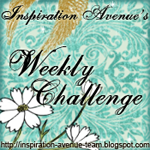 This week's prompt at The Documented Life challenge was to Recycle something into a collage. So I decided to make good use of some Happy Mail I've gotten from other members of the group recently. We send out envelopes full of goodies that we can use in our journal pages. I've gotten some neat stuff. The large flower near the bottom was cut from the envelope of one Happy Mail. And the polka dot letters, and the large flower's leaf were also cut out of some other Happy mail envelopes. The background color in blue was created with distress paint. And the other elements were drawn in with my new Posca paint pens. Another journal page created in the studio this weekend, this one for The Documented Life project. The challenge this week was to create a flap on the page. I was wanting to keep it rather simple and just draw this week. Not sure why or how I came up with this--especially since I never wear lipstick myself! But hey, when inspiration strikes, you just have to go with it. The left side image shows the flap on my page as it's closed, and the right shows the flap open. It's a wee bit blurry, but you get the idea. 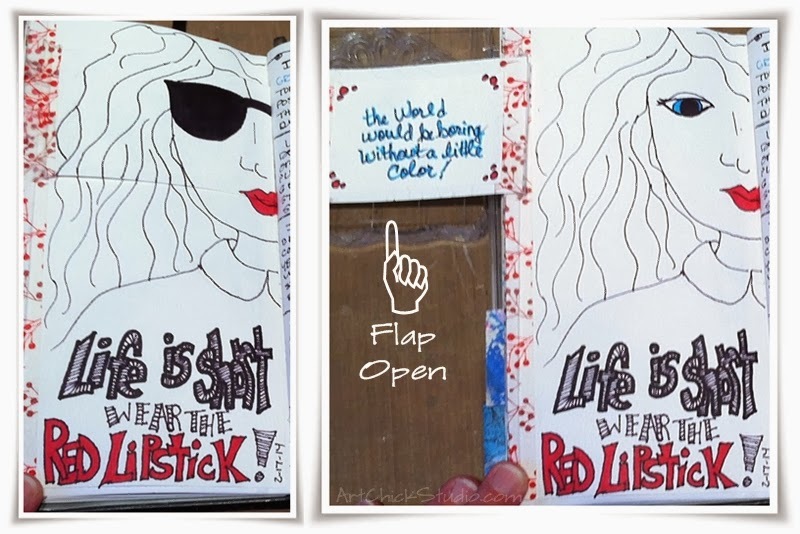 And then I just added in the flap, "the world would be boring without a little color." So true! Well, when I was little, probably from ages 4-10, I wanted to be a movie star. Not just an actress. No, a Movie Star! LOL. But that wasn't really calling to me to be journaled about this week. So I decided instead to focus on my dream for the near future. And that is, to teach studio classes in all kinds of art--mixed media, art journaling, creativity nights--lots of things! That is a goal I'm working toward. The Hubs and I purchased and old farm property last year that we have to totally (sigh) remodel. We plan to do that and move within the next couple of years. The bonus is that it has an old grainery building on it that will become my new studio, and it's big enough that I can hold classes in it. So that is my dream...for when I grow up just a bit more. And here's my journal page. The building in the background represents the grainery, which will become my studio. The background colors were all done with Gelatos. To the foreground I just added some fun scrapbook paper that is full of nature--because my future studio and our home are just outside of town. There are lots of trees and wild flowers and animals. Heaven! So this weeks' prompt for the Journal52 challenge is "Love Letter." At first I thought I'd use something from Beethoven, because he wrote some fabulous love letters. But as I was searching around for the perfect snippet, I somehow decided that I'd rather do something more personal and more meaningful. So I pulled out some of the many poems I've written about my husband over the years, and I decided to use one of those instead. Here's what I created. In case you're wondering, the background of this page is wallpaper that I wrinkled and adhered to the page. The hearts, made from posterboard, are actually underneath the tissue paper. Then I painted the blue background and the read hearts. Next I too a brown Gelato stick and dragged it over the raised parts of the paper, then blended with a wet finger. And then I wiped away areas here and there with a baby wipe to get some changes in value. And lastly, I added the poem, which I'd printed out and cut up, and distressed the edges with ink. Even after I swore to myself I wouldn't do heart art this week, I've done TWO journal pages with hearts on them. Oy! What can I say. I'm either a romantic, or a creative cliche. But either way, I guess I just had hearts in my head and they flowed out onto the pages of my art journals. This week's prompt at The Documented Life was to draw a shape, fill it with color, and then repeat. So my shape was a heart. And this was the result. The page on the left is just another art page. I like to do facing pages with different art, but the same (or similar) palette of colors. The page on the right is my prompt page. Lots of acrylic there, and some markers, ink, and of course the Washi tape on the edge (Washi tape is fast becoming one of my addictions!). This blue color is one of my favorites right now. It's appeared in my artwork a lot in the past year. We'll see how long it takes before I tire of it. :) Love how the page turned out though! New Work in Progress today in one of my art journals. 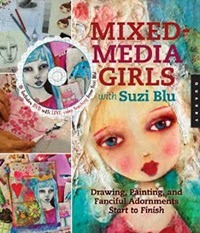 I'm in love with the whimsical and lovely mixed media girls that Suzi Blu creates. Suzi is one of the reasons I started playing with mixed media. So I'm working on doing more drawings and paintings inspired by Suzi's art and working toward putting my own spin and style into my drawings of girls. So anyway, just thought I'd share my latest effort. This may become a painting, or it just may live in my art journal indefinitely once it's finished. We'll see how I feel after she is completed. I love her so far though. You may also recall my first mixed media painting I did, called Beauty, was also inspired by the art of Suzi Blu after I read her book, Mixed Media Girls. If you're curious about the art of the fabulous Suzi Blu, just click on her book image below and that will take you to her website. You will love it! 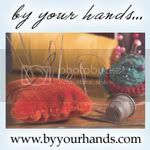 Suzi has several online classes that you can take, along with a wonderful blog. Every time I visit her blog I get inspired. And her videos are so fun to watch; Suzi is quirky and fun and so positive--it is really fun to watch her videos. 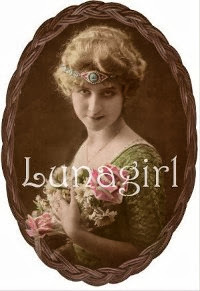 And if you're interested in her book please see the image link on the right side of Suzi's blog--it will take you right to her Etsy shop, where you can purchase it, along with some beautiful prints of her work. This week's art journal challenge for The Documented Life is to create a page inspired by something or someone (like an artist) that we like. I like so many artists, and so many styles of art, that this can be a real challenge for me to do. But as I thought about it I decided that I wanted the talented artist, Stephanie Corfee to be my inspiration. I recently bought one of Stephanie's books called, Creative Illustration & Beyond. I loved it so much that I also just ordered another of her books called, Creative Doodling & Beyond. I love Stephanie's style, I love her use of rich, vibrant colors, and all the detail that she puts into many of her pieces. So it was really very easy for me to be inspired by her art. This was the result. The page on the left is just one of my weekly pages that I create. I add notes there and what not, or just little anecdotes about the day. It's the page on the right that is inspired by Stephanie Corfee. I love how it turned out! I used Inktense blocks in the background and then doodled over the colors with white and black pens. If you are interest in seeing the fabulous art of Stephanie Corfee, please click on her name below. She has a gallery there, and you can see her books there also. I can't wait until her Doodling book arrives this week. I know that I will put it to good use with both of my current art journals! This week's prompt for the Journal52 art journal page was "Abstract Art." So I created a watercolor painting based on a project I used to have my high school art students do. It looks rather abstract, but also looks a lot like broken glass. The kids always had fun with it, and so did I.
I blew watered down black paint around with a straw first--which was probably my students' favorite thing at the time, simply because you get a little dizzy when you do it. :) After that is dry then I just picked a few colors I wanted to use and filled in some random spaces around the page with the color. I love how this looks when it's finished. And that's one more week in my art journal complete for Journal52.